We left our hotel in Sost at 9:30 AM and started our journey towards the Khunjrab Pass. On the way, we meet a police officer that unlike common police officers motioned us to ride on the left side of the road, wear a helmet and do not drive fast. 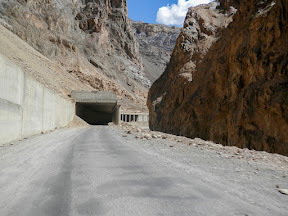 He also muttered that it’s a 3 hours bike ride to the pass and wished us a safe journey. 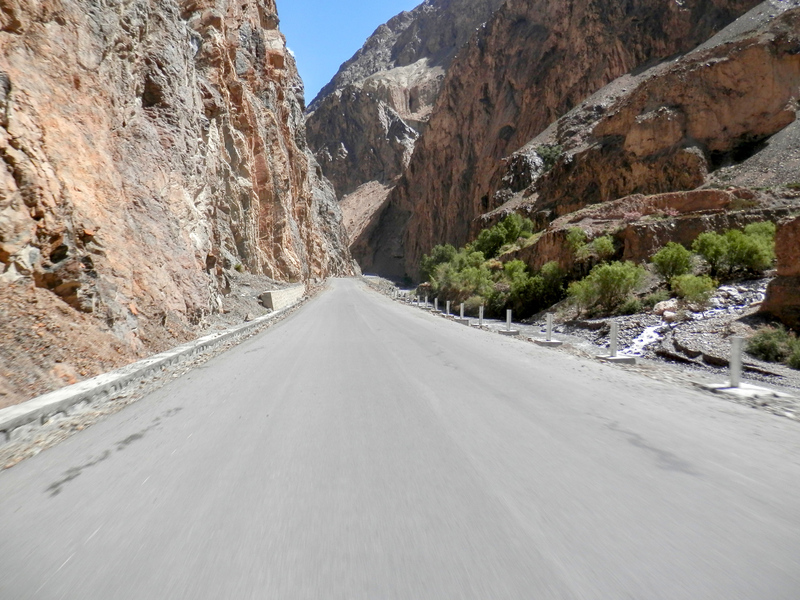 We started riding along the Khunjrab River and passed by Chapurson Valley and Misagr Valley link roads. 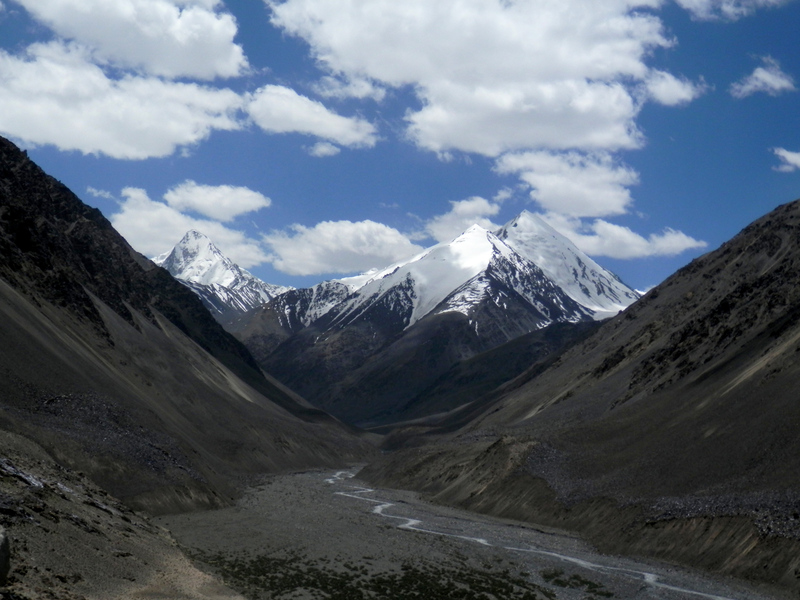 These two valleys have their own rivers that join the Khunjrab River and further mix with the Hunza River. The colour and flow of the water changed dramatically as we moved uphill of the road. 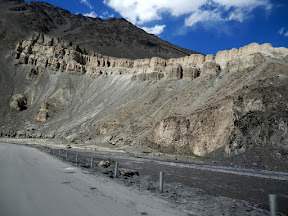 The valley walls are of black, crumbling rock (this is how the Turkish words Kara - Koram translate) and the river cuts through deep beds of gravel being residues of contaminated mud and rock slides. 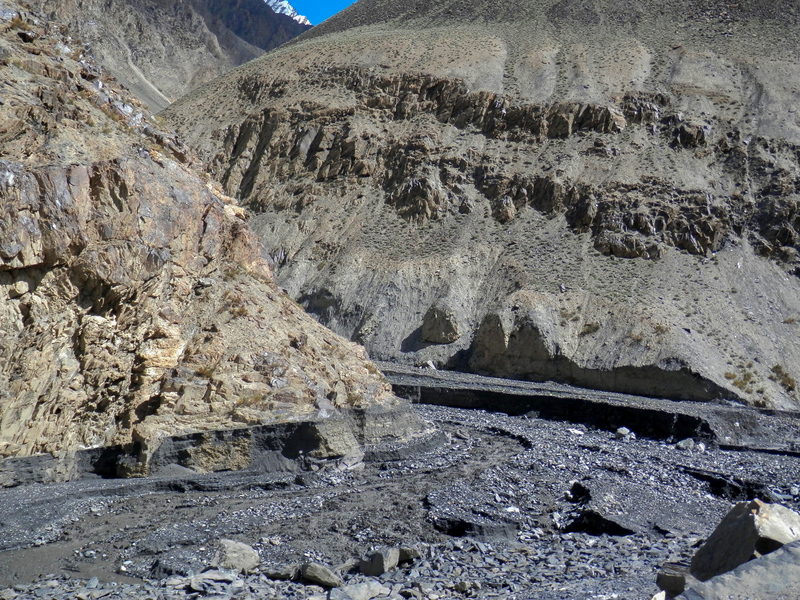 Mysteries of KKH, the black water stream is a combination of mud and rocks. The Karakorum/Karakoram Highway is merged between the tall mountains in this section. 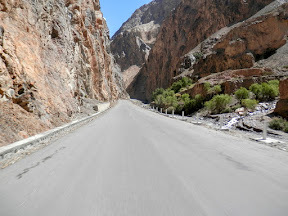 These tall mountains are on either side or shoulders of the road that you could position your head up and stare at them. The road condition is as was excellent. 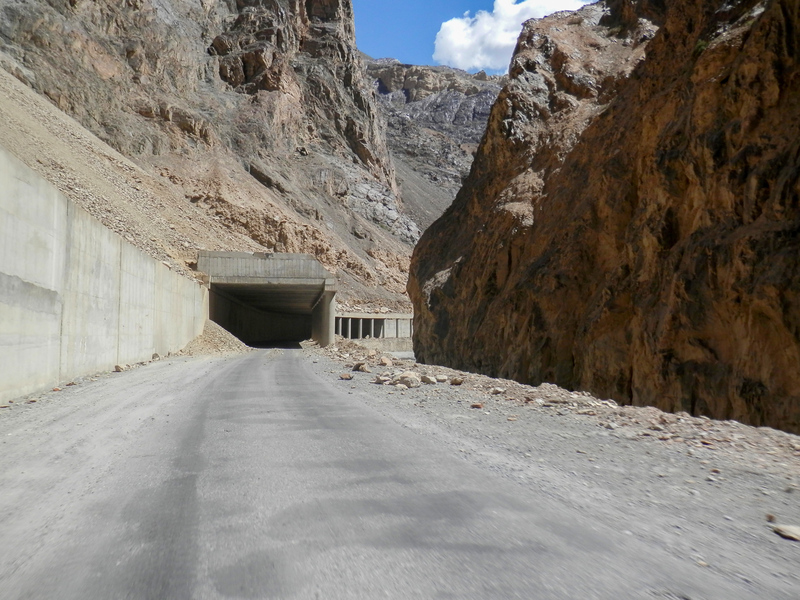 Chinese workers were still working on the tunnels to ensure the safety of travellers. We reached Die or also called Dhie at 10:30 PM. We had to put our names on the register and pay Khunjrab National Park fee to move along the way in Die (Dhie). Views of the Karakorum from the main road. The word Khunjrab is a combination of Khun mean blood and zerav mean stream in Wakhi language. It is Pakistan's third largest National Park & the primary purpose of setting up of this park was to provide protection to the endangered Marco polo sheep that is only found in this area. 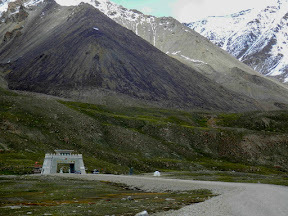 The Khunjrab Pass is the highest paved international border crossing road in the world and the highest point on the Karakoram Highway. The temperature started to dwindle down as we moved uphill of the road. The beautiful clouds constant apparition on the sky increases the enchanting beauty of the place. 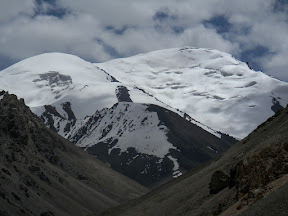 We saw the beautiful mountains covered with snow on the way to the pass. We saw “Yaks” in the Khunjrab Park which was prohibited from hunting. 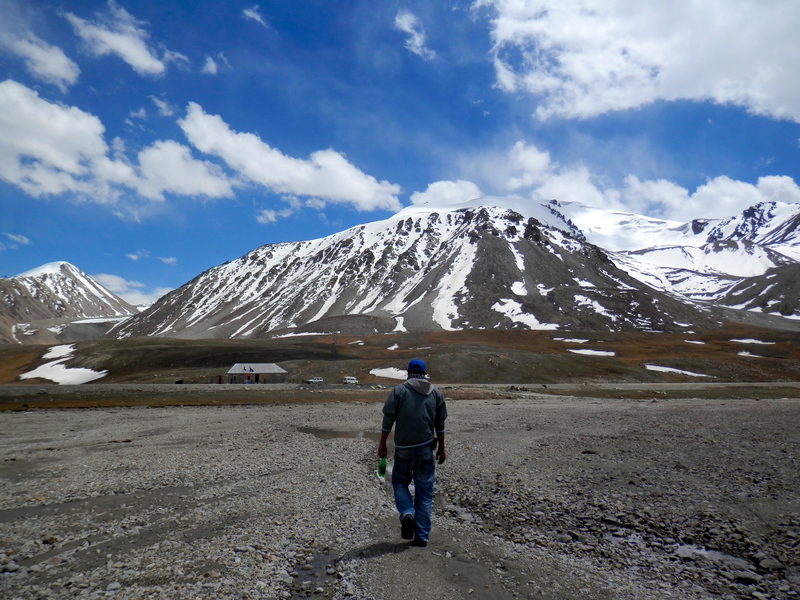 We finally made it to the Khunjrab Pass at 12 PM being the most amazing and beautiful location. The weather temperature was felt below 10°C and we started to feel cold. 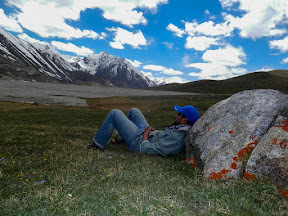 We meet a “Khunjrab Security Force (KSF)” security guard who allowed us to get into China even without having any visa. This was the best feeling ever we got a friendly treatment being outside Pakistan. The temperature started to dwindle down as we moved uphill of the road. The beautiful clouds constant apparition on the sky increases the enchanting beauty of the place. 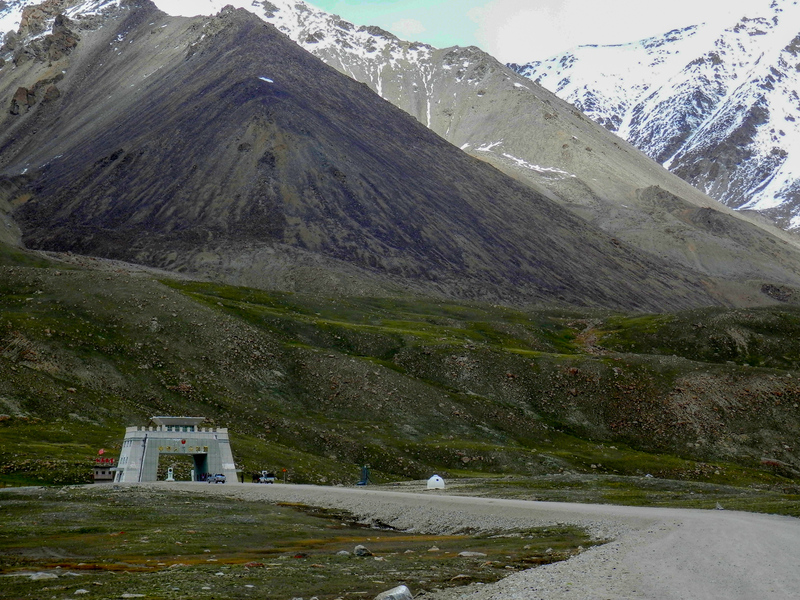 Exploring the Khunjrab Pass at the size and extent made us decide to move to Sost before getting dark. 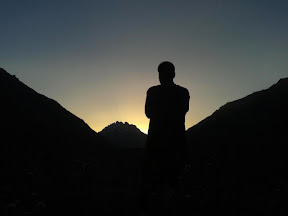 After reaching Sost we also explored the Sost Dry Port and finally sat down to look the beautiful sunset over the mountains. This was our last day in the mountain, and we were moving back tomorrow as if we were leaving something very valuable and/or priceless memories. But, to our minds we have taken much more valuable things with us like experiencing the truthfulness of the local people, their hospitality, their loyalty despite us being strangers in their land and their benevolent gesture of love and genuine friendship are the experiences that for sure would reside permanently in our hearts. Besides the scenic beauty of this land, paddling/cycling offers an amazing experience while giving one the opportunity to immerse oneself in the local and regional heritage, history, culture and cuisine away from the hustle and bustle of urban life which to our personal opinion makes for a perfect holiday. I must admit that we could not have experienced all the different locals’ warmth of genuine love that without paddling in the different towns around Pakistan. We were sincerely glad and thankful to ALLAH that we have made it to our final destination of our cycling expedition without having much trouble. We made it in less than two weeks time frame. We went really somewhat slow as it's an incredibly unique tour wanting to lap and savour the experience firsthand. We were not there to achieve something, rather, our goal is to create candid memories of our journey. I'm just a traveller on a bike. I'm not a cyclist. And I don't want to become one either. This unique experience is an “adventure of the lifetime” that finally came to an end and with the hope that this was just the beginning of a series of adventures yet to come. Gupis town stands beside giant mountain which stands tall right above it. The river is just 300m away from the road making the town a beautiful and peaceful.